The Antlers, a Wyndham Hotel is located in the heart of downtown Colorado Springs, Colorado, with spectacular views of Pikes Peak and the Rocky Mountains. The hotel is within walking distance of numerous downtown restaurants, shops, museums, and nightlife. The property features 273 newly renovated guest rooms and 22 suites, each with a work area which includes two phones (2 lines) and high-speed internet access. On site dining options consist of several restaurants, including The London Grille, Piccadilly Bar, and Duca’s Neapolitan Pizza. Be sure to check out our fully equipped fitness center, or enjoy our indoor pool and whirlpool while taking in magnificent views of Pikes Peak. 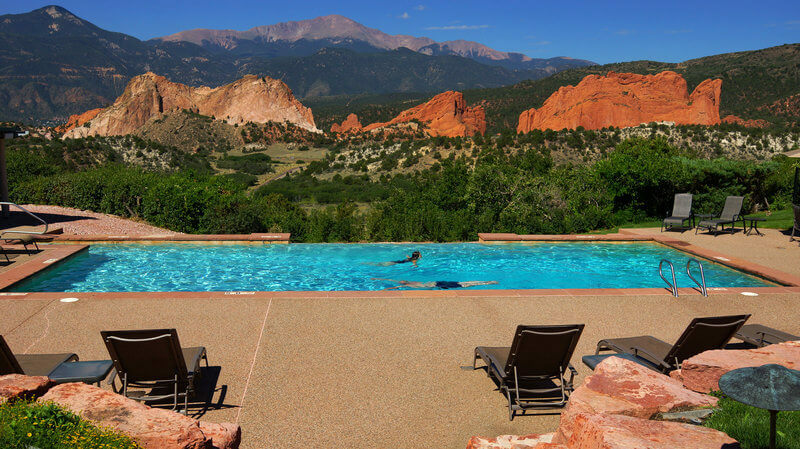 69 guest rooms at this hotel near Garden of the Gods—14 of which are suites—boast spectacular views of the Garden of the Gods National Natural Landmark and the Rocky Mountains. A legendary private club and resort for more than 60 years, Garden of the Gods Club and Resort has developed a reputation as a place where natural beauty, relaxed elegance, and standard of excellence are without comparison.